It has been a minute since I read the book, but I just finished Scarlet so I figured I would just review both of them. 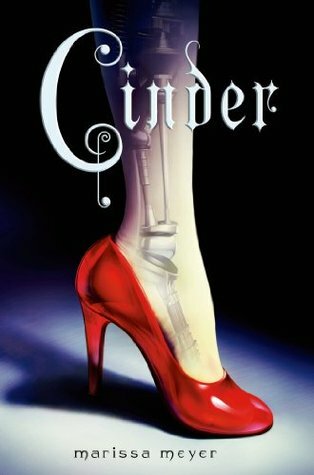 I kept seeing Cinder, and the rest of the Lunar Chronicles on Tumblr, so I figured I would give it a shot and bought the first book. Once I started reading it, I finished it in 3 days. And this was also when I was moving. Firstly; I love that it is a fairy tale retelling without throwing all pieces of the fairy tale in your face. She is an Orphan. She has 2 step-sisters, though one is nice to her. Her step-mother hates her and thinks that it’s all Cinder’s fault her husband died. Cinder works all day to bring in money for this “family” even though she doesn’t get to use any of it. Her only friend is an android named Iko. Yes, I know that’s not part of the original story, but this is a futuristic story. Her best friend can’t be a mouse, now can they? For set-up, we have a 16 year old girl who happens to be a cyborg and a mechanic. She works in a booth in the market area of the Eastern Commonwealth in the city of New Beijing. A boy, we later find out this is the crown prince Kaito, comes to her needing help fixing his android that he has had since childhood and heard that she was the best mechanic around. So she takes the android. There is a breakout of the plague and her younger step sister, the nice one, catches it. And dies. Her step-mother blames Cinder for her death. Sells Iko for parts. Tells Cinder she has to do this cyborg study thing. She meets Dr Erland, who happens to be a Lunar hiding out on Earth. He suspects things about Cinder that are pretty obvious to the reader at this point in time. I mean. Come on. With the set up we are given, how could it NOT be her? AND it’s “based” off Cinderella. Of course it’s her. Cinder fixes the bot, finds a Direct Communication chip in it that the Lunar Queen Levana had someone put in to spy on Kai. She gets crucial information from this communication chip. She decides to go to this ball/coronation for prince, now emperor, Kai to tell him this information. There she, of course, runs into her step-mother who obviously disapproves of her being there. Cinder also meets the Lunar Queen, and Cinders cyborg lie detector sees through the Queens glamour and sees how she truly looks. Something no one has ever seen a lived to tell the tale. People chase Cinder. She goes running. Her foot falls off. Kai sees her for who she is. Cinder gets imprisoned for being a Lunar fugitive, something she didn’t know. And Dr Erland comes and tells her a few crucial things. And gives her a new hand and foot. I really did like this book. Hence me reading it in 3 days! There’s a lot to the main characters, and it’s always interesting to know things about them before they even do! I suggest this book. Go pick it up. And if you like it, pick up the other books associated with it. The finale is coming out in November! This entry was posted in Book Review and tagged book, book review, book reviewer, books, cinder, lunar chronicles, marissa meyer, review, reviewer, young adult. Bookmark the permalink. This series is just so amazing.